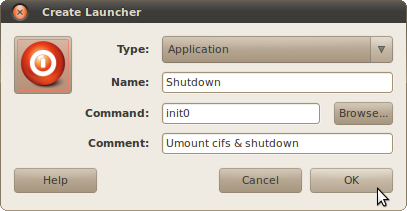 If You mount samba shares using cifs method like I, You probably have met with delays at shutdown or restart. To avoid this delay it is necessary to umount all samba shares before rebooting or shutdown your computer. There are many solutions to fix this problem, but no one did not work for me when i am connected via wifi. 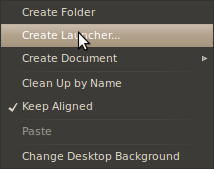 So I made two simple launchers for Reboot (init 6) and Shutdown (init 0). Note: For more info about umount type man umount in Terminal. That's it. Now if You enter sudo init6 in the terminal, all samba shares with cifs will be umounted and the computer will be restarted without any delay. This solution works also with wifi connection. This line means, that all users in admin group can use the init command without password prompt. Next step is to make two launchers with nice icons. 2. Fill out needed fields. Click on the icon to choose an icon from disc. If you do not have any, Google helps you. Ha, this is what I call a pretty dirty hack, I’m sure there is an ‘official’ way to do this!